When you first begin to study movement, you do not need to look at what the muscles are doing. You need to look at the movement of joints. Anatomic position is the standard reference point, to begin to understand Kinesiology. Stand up straight with your palm forwards, as in the graphic above, that is the anatomic position. By studying movement, you can design a more effective program of exercise for yourself, friend or client. If you sit in an office all day, you are probably not looking to become the next Mr. America body builder. You want to have an exercise program that improves your functional ability to do the things that you want to do. Move furniture, carry groceries, play with the kids and/or grandkids, lift, carry, walk without getting winded. I have to admit I never thought much about Kinesiology before, but learning about it now, opened my mind to different ways of working out. If you are not or do not want to be a bodybuilder. This is what Kinesiology can tell you. You should train like a bodybuilder if you want to be a bodybuilder. Otherwise, we should train using movements that help us achieve our physical fitness goals. We should train to improve our ability to perform activities, practical activities. With Kinesiology, you study movement, describe the movement and apply exercise to improve the movement. When the angle of a joint shortens, this is called flexion, when it lengthens, this is extension. Think of your elbow when you do a curl. When the angle between your forearm and your bicep is shortened, then you are doing flexion. When you lower the weight and the angle lengthens, this is extension. 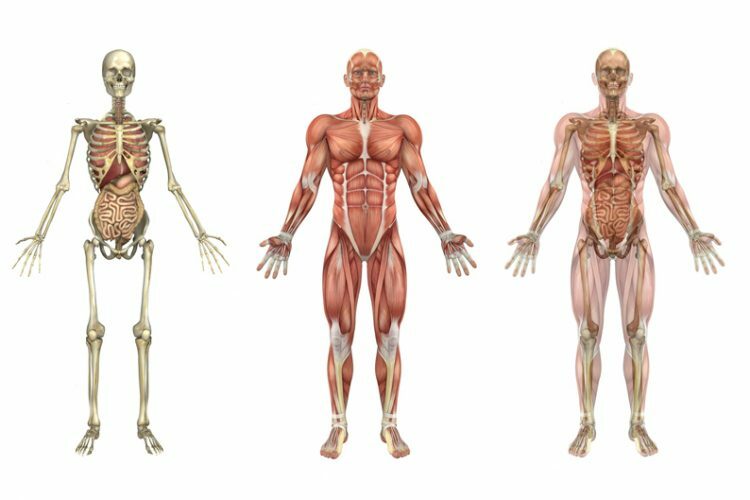 Think of the major joints in your body, your ankles, knees, hips, elbows and shoulders. You can define exercise as an activity that when joints are moving, there is effort against gravity. So, back to the biceps curl, the main exercise is when you are lifting the weight, moving against gravity and performing elbow flexion. The curl is a single joint exercise. An example of a multi joint exercise is the squat. Picture the squat in your mind and you will see that the main movement against gravity is when you lift the weight from the full squat position. At that moment, you are performing hip, knee and ankle extension. There are two joints in the body where adduction and abduction apply. Imagine a line that goes down from the top of your head, right in the center of your body, dividing your body into two halves. This line is called the midline. When your leg or shoulder move away from this midline, this is called abduction. If your leg of shoulder moves towards this midline, then you have adduction. With this knowledge, now we can observe an exercise and define the joint movements of the exercise. Bear in mind that a change of grip from wide grip to close grip or vice versa can affect the joint movement of any expected exercise. The shoulder joint can do flexion, extension, abduction (when the shoulders move away from the midline), adduction (towards the midline), rotation, internal and external, as well as horizontal abduction and adduction. The elbow joint does flexion and extension. The hips can do flexion, extension, rotation – both internal and external , as well as abduction and adduction. The mere change of grip for the same exercise can change the movement of your joint. If you use a wide grip on the bar above your head, when you pull down, you will see elbow flexion and shoulder abduction. With a close grip, you will see shoulder extension and elbow flexion. With a wide grip (wg) during the exercise phase, which is that moment when you are pushing against gravity. That moment of maximum effort, you are using elbow extension and shoulder abduction. With a close grip (cg) you are doing elbow extension and shoulder flexion. A single joint exercise is using only one joint. Such as a bicep curl or leg extension. A multi joint exercise uses more than one joint. Such as the squat which uses extension of the ankle, knee and hip joints. The spine is also capable of flexion , like when you do crunches. And extension when you straighten the spine even further back as in a superman floor back exercise. Last, lateral extension when you move your spine to the side, as in a side bend. What has your experience been with studying Kinesiology? Have you ever had to go to physical rehabilitation? Have you trained for a specific sport with specific exercises? Become aware of how amazing your body is. As you become more aware of the movements that you do every day, you can train more effectively. Exercise to improve your functional ability to perform what you need to do on a daily basis. If you are not a sumo wrestler, do not train like a sumo wrestler. Let's not take the joint movement capability of our bodies for granted. We can train more effectively for the joint movements that we need to do every day in our life. This is the promise of kinesiology. And that is the answer to what is kinesiology.